The Cheese House Route 7A, Arlington, VT 802-375-9033-formerly part of a chain of cheese wedge shaped buildings, now a standalone with only a glimmer of its cheesy past. But you can buy cheese here. Outback Pizza-Brick Oven thin Pizza and Club with live music. McGrath’s Irish Pub, at the Inn at Long Trail, Route 4, Killington, (802) 775-7181, serves light fare (soups, sandwiches, desserts) along with hearty dishes like shepherd’s pie and Guinness stew (each $6.95). There is live music on weekends. open until 2 a.m. Most motels from downtown Rutland to the Killington, 12 miles away, are served by transit, known simply as The Bus. Tickets cost $1, but most lodging establishments give tickets to guests. Mountain Meadows Lodge, 285 Thundering Brook Road, Killington, (800) 370-4567, sauna, outdoor hot tub. The lodge has a variety of winter equipment, including toboggans and snowshoes, for guests. Massages are available. Rooms start at $85 for two with a full breakfast. Snowed Inn, a bed-and-breakfast at 104 Miller Brook Road, Killington, (800) 311-5406, outdoor hot tub. Each room has private bath, cable TV and phone; two rooms called suites have a fireplace and a Jacuzzi. Rates range from $85 to $240 for two. Beattie’s Trailside Lodge, 115 Coffee House Road, Killington, (800) 447-2209- rooms are furnished with built-in single and double bunk beds. Rooms are advertised as TV- and phone-free; two movies are shown nightly in the common rooms. There is an outdoor hot tub. A general wake-up call is sounded at 7 a.m., and family-style meals are served at set times. A number of packages are offered, with prices averaging about $45 a person, including meals. Turn of River Lodge 5672 Route 4, Killington, (800) 782-9867, 60’s- era ski lodge, has 12 rooms, most with private baths and dorm-style rooms that sleep up to 20. Rates from $23 a person for a dorm room, and from $54 for a private room for two, including breakfast. The Wobbly Barn, Killington Access Road, Killington, (802) 422-6171. steakhouse, four bars, dance floor and stage where live music may range from swing to rock. The Paramount Center, 30 Center Street, Rutland, (802) 775-0903, Gets National acts and off broadway stuff. Home of the Waking Windows Festival. Seven days is the local alternative weekly. Burlington is home of the University of Vermont and it is also the home of old hippies (like Ben and Jerry) and new hippies (like Phish). Phish was the house band at Nectar’s in downtown Burlington. Downtown has the Church Street pedestrian district with outdoor dining and shopping. Lake Champlain is a five-minute walk down the hill, and the waterfront has more restaurants, and various tour boats. You can also take a ferry across the lake, and take your car along to upstate NY. 19th century B&B called the Richmond Victorian Inn (191 East Main Street, 888-242-3362). $75-$125 a night. 802-651-8710), which has guest rooms for $125-$225. There are no less than four ski resorts within an hour (Stowe, Sugarbush, Smuggler’s Notch and Bolton Valley: call 802-223-3443 for info). There are inexpensive factory tours of Ben & Jerry’s (Rte. 100, Waterbury, 802-882-1260). The Shopping Bag -166 North St, Burlington, VT 05401 (802) 658-4790-Corner store with an amazing burger! Take one out and go down the street to watch the sunset. Handy’s Lunch-74 Maple St., Burlington, VT 05401 (802) 864-5963 Great burger and breakfast place. Only open 7 am to 3 pm. For seafood in a waterfront setting, there’s both Isabel’s (112 Lake Street, 802-865-2522) and Shanty on the Shore (181 Battery Street, 802-864-0238). The food’s not fancy, but the view is great. 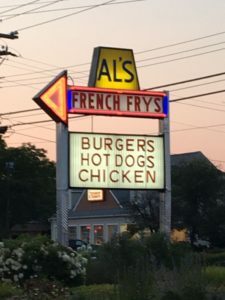 Al’s French Frys-1251 Williston Rd, South Burlington, VT 05403 (802) 862-9203-Great frys burgers and ice cream. Not good onion rings. Nectar’s (802-658-4771) has live music every night. Music ranges from blues to jazz to rock. The Rusty Scuffer offers an alternative to white guys drinking pints of Magic Hat Ale; the club has a different theme every night. Ri Ra (123 Church Street, 802-860-9401) has the best Guinness in all of Burlington. Motel open-year round, Drive-in open end of April through mid-September. The name says it all! Cajun’s Snack Bar-1594 VT-100, Lowell, VT 05847 (802) 744-2002-Seasonal snack bar with burgers. Ye Olde Tavern-5183 Main St Rte 7A, Manchester, VT 05255 (802) 362-0611-fancy schmancy 1790s joint. Vermontasaurus is a 25-foot-tal folk art representation of a dinosaur at the Post Mills Airport in the town of Thetford, Vermont.